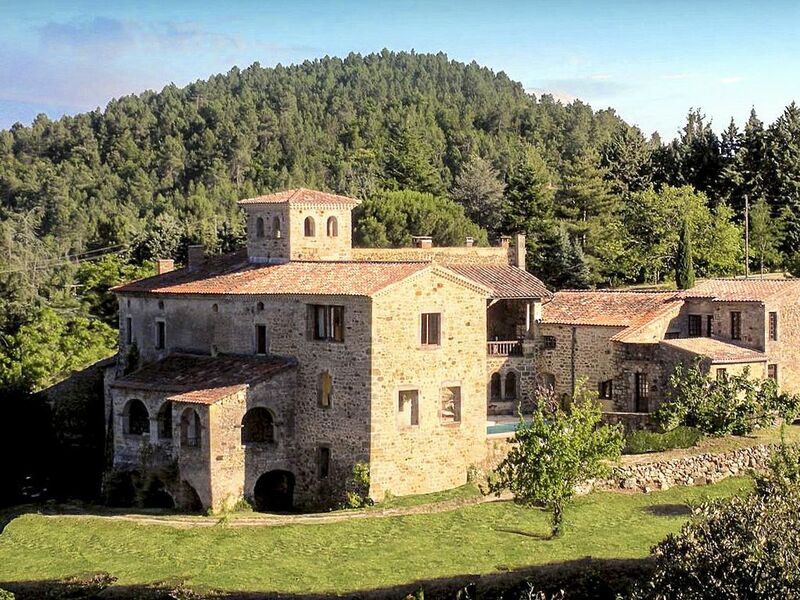 The foothills of the Cévennes mountains positively embrace this stone chateau in Languedoc. Sitting at the top of the 19th century tower with a 360 degree view, you’ll feel like a king or queen of the forest below. The three reception halls and yoga/seminar room make this a clever choice for a company retreat or family reunion.The wide, wonderful private pool is the centerpiece of outdoor life at this holiday chateau. No less stunning are the mountain views from the dining terrace, or from the many nooks and crannies in the chateau itself. The 11 bedrooms are all furnished simply, letting hills outside adorn the space. The kitchen is a special treat - it has been beautifully updated, yet it's still in harmony with the old stone ceiling above.Tucked on the edge of the Cevennes National Park, there are unlimited outdoor adventures to be had from your holiday chateau. Be ready to retreat from the world - the nearest tiny town (Banne) is a 25 minute walk away. Not just avid hikers be in heaven, there are natural wonders nearby everyone will love; in particular you'll want to visit the caves and grottoes of la Cocalière. Simply Chateau was set up in 2003 after two old school chums enjoyed a fantastic holiday with friends in a French chateau in the Dordogne. Oliver & Ravi, the two directors of the company, were amazed at what terrific value these stunning chateau rentals represented and decided to spread the word. Soon after the website www.simplychateau.com was born. Today we deliver a wide range of luxury villas, private chateau and charming farmhouses throughout France, Italy, Spain, the UK and the Caribbean. We have something for everyone from charming manor houses representing great value for money to fully catered & serviced luxury chateau, all handpicked and chosen with care. Bookings are made direct with the owner of your chosen property to guarantee you get the best booking price available. At Simply Chateau we only work with the very best rental properties on the market. All of our properties have been handpicked and we take our customer feedback extremely seriously. We operate a ������three strikes and you���re out������� policy - that is to say if we have 3 negative reviews relating to any of our properties we cease to advertise it. We have properties to suit every taste and budget, all chosen with care by our expert team for their unique character, fantastic features and stunning countryside locations. Free Concierge Service: As luxury rental specialists we have all the experience in the world helping each and every one of our customers find the most suitable property for their dream holiday. All you need to do is provide us with the details of what you imagine your dream holiday to be, and we'll find the perfect property for you. We can make sure that every arrangement is planned to perfection and each element of your holiday has been refined. Transfers, catering, maid service, tours and activities can all be prearranged to your specific requirements. 100% Financial Guarantee: We realize that financial protection is an important consideration when choosing a holiday company so to ensure you have complete peace of mind we are bonded members of ABTA. Lowest Price Guarantee: Simply Chateau ���simply’ processes the bookings and credit card payments on the property owner’s behalf. The owners themselves set the rates so you know you are getting the best available rental rate when you book. Avoid Internet Scams: Each and every property listed on our website has been checked to make sure that it actually exists. This ensures that you do not become a victim of an internet scam as can happen through an ordinary listing website. Amenities: - Gorgeous tower with a 360° view of the surrounding landscape. - Heated swimming pool. - Internet. - Pets considered. - Wine tasting. - Ground floor bed/bath. - Hunting/stalking. - Fishing. Our party of 20 had high expectations having gained a sense of what was in store from your website.But the reality was altogether different. On arrival we were all strangely silent, genuinely shocked by the extraordinary beauty of your home and its setting. On our first day we didn't leave the house and it was hard to drag ourselves away after that but the stunning landscape beckoned and on subsequent days, guided by your thoughtful guide, we explored the region on bikes, foot and on one day picnicked at the watering hole by the bridge where most of the children and adults including our four year old jumped off the cliff into the water. We ate like kings, cooking for ourselves every day in your extremely well equipped kitchen - delights such as freshly made bread, ice cream, barbecued squid and prawns. On our last night Ino cooked for us.We worried for him because there was such culinary talent among our party we thought he would be unable to reach the high standards to which we had become accustomed. But we were proved wrong. He cooked a splendid feast and it was a real pleasure to relax so completely on our last night. The stunning pool was in constant use when we were home...but the pool was not only a joy for the kids but also for the adults - it is so rare for a house pool to be so long that it allows for a proper swim. Thank you both for allowing us to spend the week in your incredible home.There was total consensus that this was the best holiday any of our families had had. It will not surprise you to learn that we would love to return. So please, please if you have any spaces left for next summer do allow us to book again. With much gratitude and thanks. The nearest airport is Nimes and the nearest town is Banne. Banne hosts an art festival during the summer and is a meeting point for various guided hikes. Grab a map from the living room and set off into nature. Here on the edge of the Cevennes national park there����s so much to explore - forests, rivers and viaducts, or take a 25minute walk downhill to the medieval village of Banne. Nearby are the deep caves and grottes of la Cocalliere. Swim in our new 21 metre pool or take a short drive to an idyllic swimming hole, complete with enormous rocks and waterfall. There are tennis courts in St. Paul le Jeune and les Vans. Biking in the cevennes means miles of unspoilt scenery, wildflowers, wildlife, and few human encounters. The Ardèche river with its famous Pont d'Arc is a short drive away. It is easy to rent canoes and you can spend the day floating down the river or sun bathing on the shores. Guide Price: £2,625 - £4,500 (Low to high season price range based on exclusive hire of the property for a week). Short Breaks: £2,625 - £4,500 (Low to high season price range based on exclusive hire of the property for 2 nights). Security deposit: €1000. This is paid on arrival and will be refunded in full after departure subject to damage inspection. Energy costs: Included in the rental price. End of stay cleaning: Please enquire.